King Ibn Saud and President Roosvelt. Photo by FDR Presidential Library & Museum/Flickr. With the outbreak of World War I, the British, whose influence was growing on the Gulf coast of Arabia, found local allies in the Hijazi Hashemites and the Al Saud, both eager to assert their independence from the Ottomans. 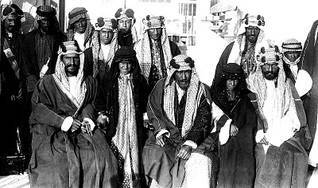 The Al Saud established their control in Riyadh in 1902 and, with the approval of the British, expanded into the Eastern Province in 1913. They continued their expansion in central Arabia and conquered Hail in 1921, the centre of power of the Al Rashid in central Arabia. From 1915 the Hashemites co-operated with the British to oust the Ottomans from the Hijaz, but they were driven from their historical Hijazi power base by Abdulaziz Al Saud, usually referred to as Ibn Saud (born 1876), in 1925. By 1930 all local emirates in Arabia vanished, with the exception of that of the Saudis, who declared their newly founded realm the Kingdom of Saudi Arabia in 1932, with Ibn Saud as its first king. Two factors played in favour the Al Saud. Its emir Ibn Saud revived the puritanical Wahhabi religious tradition and enlisted the various tribes of Arabia in a religious war to fight blasphemy and purify Islam. In the process, a centralized political leadership emerged under the guise of a religious umbrella. Second, British support for Ibn Saud guaranteed the approval of the imperial power whose sphere of influence expanded in Arabia following the demise of the Ottoman Empire. In its early days the Saudi Arabia had meagre resources. It depended on small taxes levied on commerce in the Eastern Province and revenues from pilgrims visiting the Hijaz, as well as British subsidies. The discovery of oil in 1938 brought new and transformative income to sustain the newly founded state. In 1933 Ibn Saud signed an agreement with Standard Oil of California (SOCAL), to begin exploration for oil. In 1939 the first tanker carrying liquid fuel sailed from Ras Tanura. In 1944 the Arabian American Oil Company (ARAMCO) was established to deal with oil exploration and transportation. Oil revenues reached USD 13.5 million in 1946, bringing a substantial income to the state. By that time, British patronage gave way to American commercial interests and political influence. Saudi Arabia became important for the American government for its oil resources and its strategic location.